The Big Yellow One's the Sun! Slow down and watch the moon devour the sun! And, if Groundpseak gets its act together, maybe even nab a souvenir! Gee, qbee37, the fam and I really want to witness the Total Solar Eclipse, but we're going to be crossing the great prarie and don't have any idea when or where we should stop. What's an adventurous cacher to do? Well worry no more intrepid traveller. 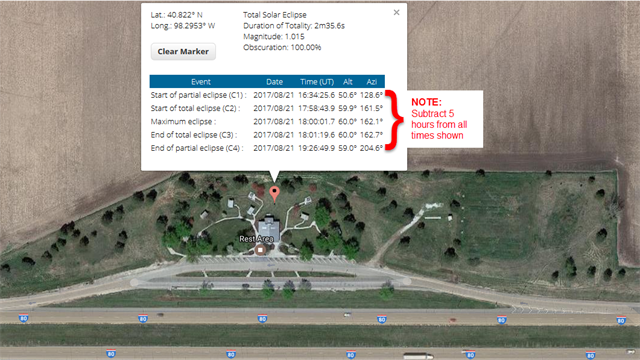 Hop in your cache-mobile on August 21st and point its Nav system at the westbound I-80 Rest Stop at milepost 316, a prime location that sits just .6 miles southwest of dead-center on the path of totality (a convenience that costs us only 2 seconds of totality). When you get there, you can join a bunch of like-minded cachers in oohing and awing at this rare and spectacular spectacle from 12:30 to 1:30 PM CDT! So come join the fun and bring your trackables; I'm sure they'll be able to hitch a ride to distant locations. And no, one need not be a traveller to join in the fun, although local cachers should consider car-pooling to avoid overwhelming the parking. 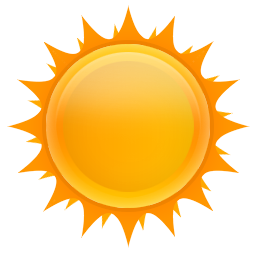 And most importantly, don't forget your eclipse-safe sunglasses! !